In 2013, CIAN Education developed a new tool to survey alumni attitudes regarding the impact of CIAN participation on their careers and professional development. This survey was administered via Surveymonkey.com and was sent to 51 CIAN alumni. Eighteen individuals completed the survey and results indicate that CIAN student membership impacted the alumni in several positive ways. Respondents were first asked about their highest level of education; of the 18 eighteen individuals, 53% held M.S. degrees, 35% held PhDs, and 12% held a Bachelor’s. Also, during their time as CIAN students, 86% assert that they were aware of CIAN’s overall purpose, mission, and goals, showing that CIAN effectively disseminates this type of information to its student members. I was aware of how my research contributed to CIAN’s goals. CIAN provided opportunities for personal development that I would not have had otherwise. I would recommend to current students that they get involved with CIAN. My involvement with CIAN has had a lasting impact on me as a professional. Next, to evaluate CIAN’s effort to cultivate Engineer of 2020 attributes in its students, alumni were asked to what degree they felt their involvement with CIAN helped them develop eight of these skills: business management and leadership, analytical skills, practical ingenuity, creativity, communication, ethical standards and professionalism, life-long learning, and dynamism, agility, resilience, and flexibility. 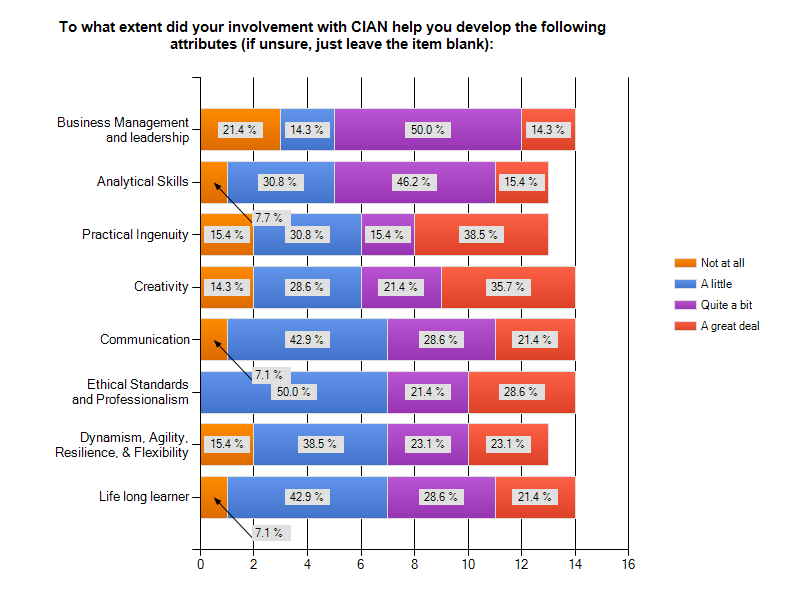 The graph below displays the complete set of responses, with about 54% of responses indicating that CIAN involvement helped students acquire and hone these attributes “quite a bit” or “a great deal.” Another 35% said that these attributes were engendered at least “a little bit.” The two attributes which received the most agreement were Analytical skills and Business Management and Leadership, implying that CIAN’s strength lies in cultivating these two qualities. Overall, E2020 attributes have certainly been fostered however there is room for improvement and increased emphasis on these qualities throughout CIAN’s student activities and programs. One survey item asked CIAN alumni how soon after graduation they obtained a job. Fifty-three percent said they obtained a job within one month of graduating, while 7% found a job between one and two months after graduation and 40% went on to graduate school. Of those who began full-time employment, 67% found their first position in Industry, 33% filled posts in Academia such as assistant professor and post-doctoral researchers, and 100% are still currently employed. Among the various employers of these CIAN alumni are FaceBook, Google, IBM, Intel, Illumina, NVIDIA, and the Tyndall National Institute. Two of the respondents have started businesses since graduation, several have published papers, and one alumnus has filed a patent and submitted several others. In summary, CIAN alumni have secured positions with prestigious companies and institutions, are currently thriving in their careers, and have made it clear that CIAN was an important part of their preparation. This entry was posted in Annual Report, CIAN Stats and tagged Alumni, CIAN Students. Bookmark the permalink.